Before the controversial final play of the game against the Packers, Russell Wilson was 9-20 for 106 yards with 1 touchdown and 0 interceptions for a passer rating of 78.3. A passer rating of around 80.0 represents a mediocre game. ESPN has invented their QBR rating that takes into account many more factors, including things like when the throws were completed, and the defense the quarterback was facing. Wilson finished with a 28.5 QBR, which means a quarterback who plays a game like that should win roughly 28.5% of the games he plays. I have not had the chance to watch the replay of the game yet, but there were two plays that stood out from the stands which illustrated a key area Wilson needs to improve on to take his next developmental step. Seattle’s first possession started a couple of runs to get to a 3rd and 2 situation. 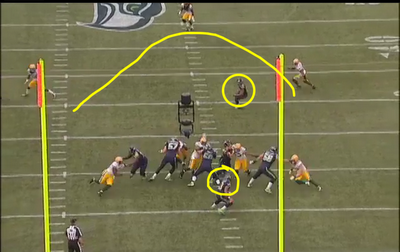 A false start on Russell Okung left the Seahawks with 3rd and 7. Wilson takes the snap and appears uncomfortable from the start. 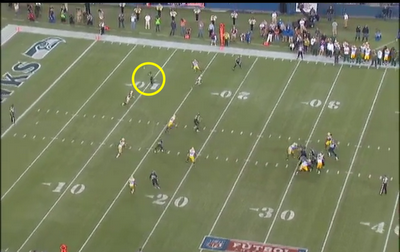 Golden Tate is open almost immediately directly in front of Wilson. 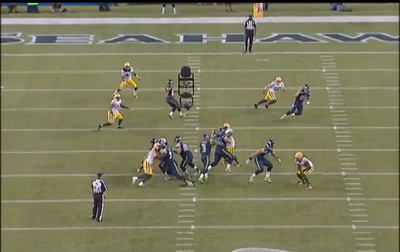 Wilson turns his head, and looks to scramble almost immediately after the snap. Tate is sitting down wide open against the Packers zone. Wilson never sees him, and it was certainly not a height thing based on the sight lanes he had to look through. This is the same play from another angle. 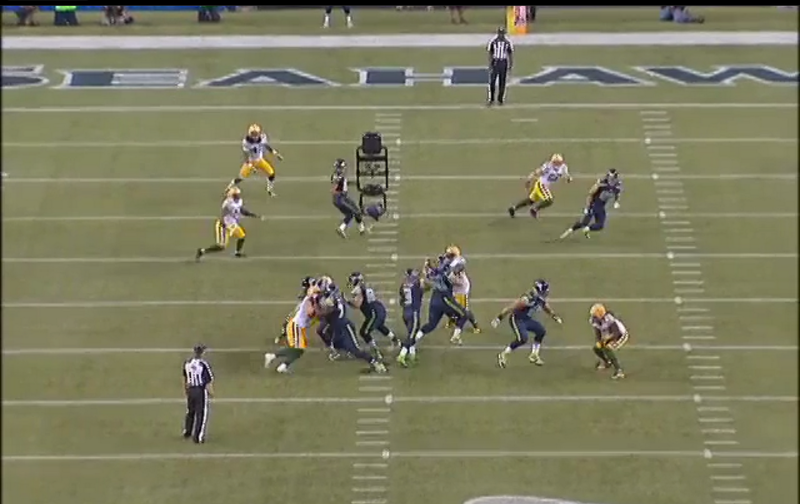 This shows how clean Wilson’s pocket was to throw from, and again, how open Tate was. Obomanu is the receiver in the top of the screen that is blanketed. 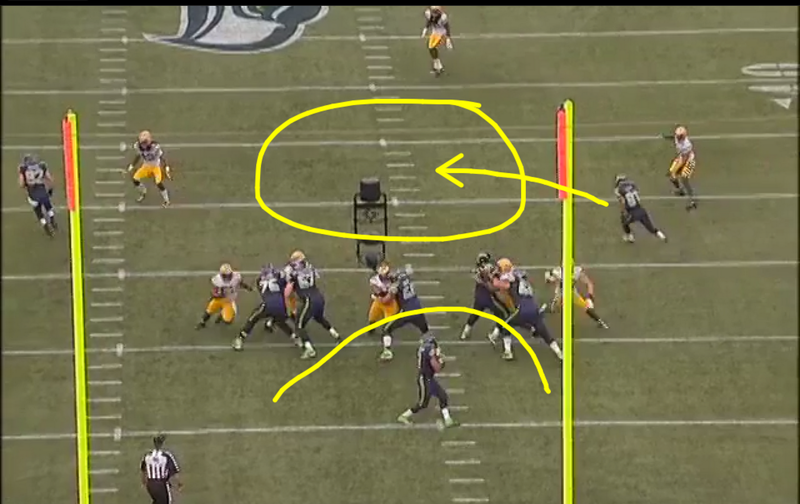 Wilson scrambles to his right and has to throw the ball out of bounds. Fourth down. This was the penultimate drive for Seattle. 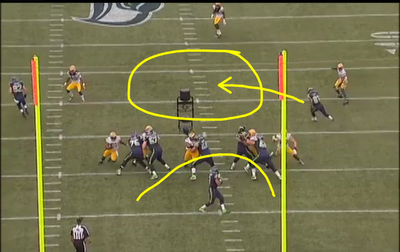 Wilson takes the snap and makes a very rapid decision to throw to his tight end for a safe gain. It is not a terrible play, by any stretch. It also was not a winning play. 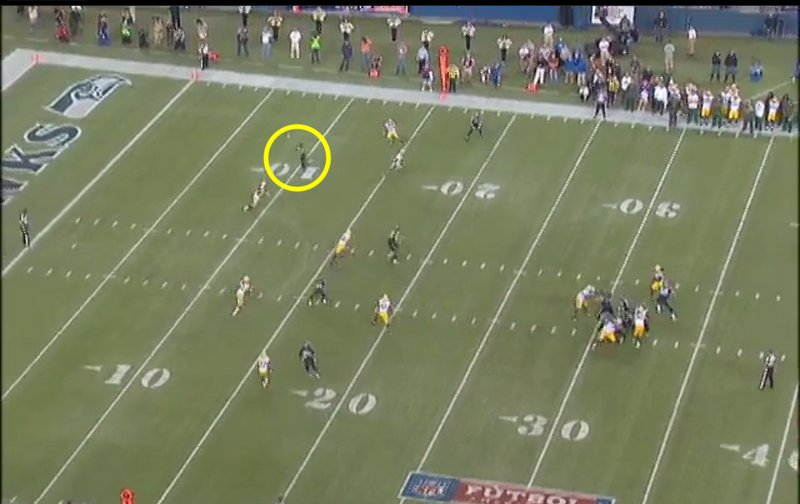 If Wilson had taken just one more breath before making his throw, he would have seen Sidney Rice running into open space on a blown coverage. Wilson is already winding up at this point, locked in on Miller. Rice has his hand raised, with nothing but end zone in front of him. This the same play from another angle. 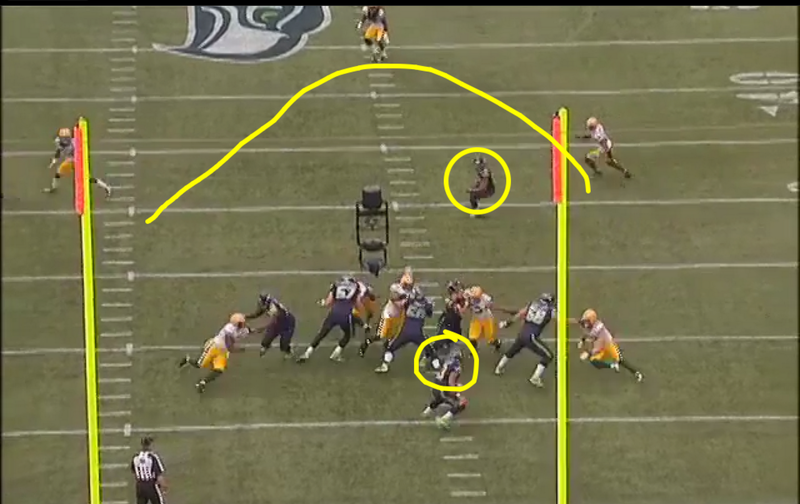 Rice does not appear in this view, but notice the pocket Wilson has to throw from. He did not make this throw to avoid getting sacked. There is a nice pocket, and great throwing lanes. There was six minutes left on the clock, so this was not a hurry-up situation. This was a chance to win the game cleanly. Wilson deserves credit for manning the ship while this team beat two powerhouses in the NFL. He deserves credit for not throwing any interceptions the last two games. He makes nice plays with his legs to extend drives, and has thrown a touchdown in each of his first three games. His patience in the pocket needs to improve. It is unclear if the pounding he took in the first game against the Cardinals caused him to lose some confidence in his line, or he is just showing some rookie jitters. Either would be understandable. He needs to figure out what is necessary to trust his line, and go through his progressions. There are those that will tell you the passing game is struggling because of receiver play. Jackson was more productive passing to these receivers than Wilson has been. They did not all get considerably worse after the off-season. 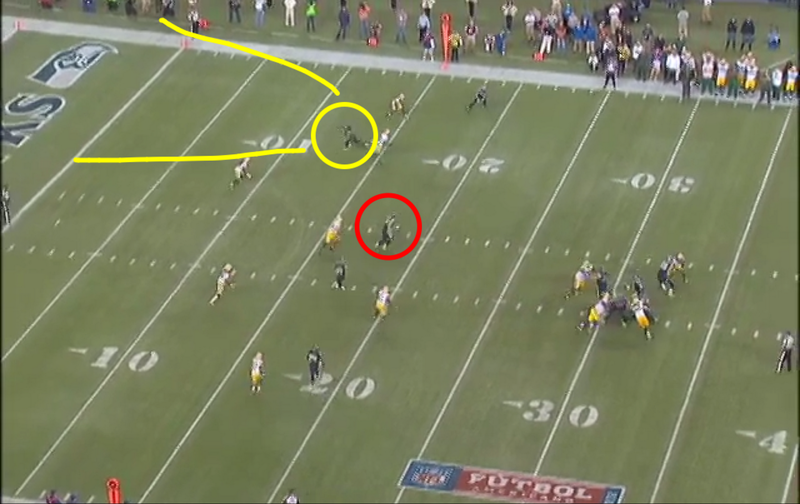 In fact, Tate and Braylon Edwards represent improvement over who was running those patterns last year. The good new is Wilson can make these throws. He is smart enough to make better choices. We often talk about giving him time to develop. 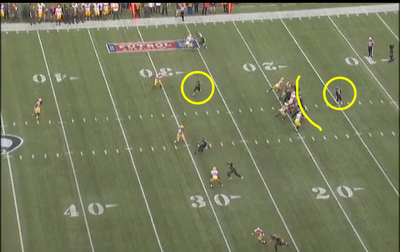 In this case, he must give himself time to find the right receiver, and make the indisputable winning play. Can Russell Wilson Win 13-15 Games in 2012?